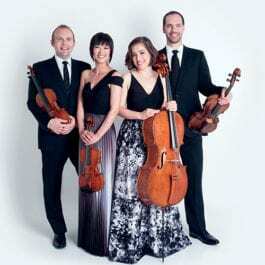 Winner of the prestigious CMA Cleveland Quartet Award, Philadelphia's Jasper String Quartet is the Professional Quartet in Residence at Temple University's Center for Gifted Young Musicians and the Founder and Artistic Director of Jasper Chamber Concerts. The Quartet launched their inaugural season of Jasper Chamber Concerts in 2016, a series in Philadelphia devoted to world class performances of masterworks from around the world and Philadelphia, featuring Philadelphia-connected composers and performers on each concert. The Quartet completed the the third season in 2018-19. The Quartet also looks forward to their 2019 commission of Lera Auerbach, Akira Nishimura, Chris Theofanidis and Joan Tower for 4 Seasons | 4 Composers, a work bringing the brilliant muse of the seasons to the string quartet genre. The Jasper Quartet's next album on Sono Luminus will feature Kernis Quartet No. 3 and Debussy Quartet. This, their 5th album, completes the Kernis Quartet Cycle and adds to their recordings of Beethoven Op. 59, No. 3, Beethoven Op. 131, and Schubert Death and the Maiden. Formed at Oberlin Conservatory, the Jaspers began pursuing a professional career in 2006 while studying with James Dunham, Norman Fischer, and Kenneth Goldsmith as Rice University’s Graduate Quartet-in-Residence. In 2008, the quartet continued its training with the Tokyo String Quartet as Yale University's Graduate Quartet-in-Residence. That year, the Jaspers swept through the competition circuit, winning the Grand Prize and the Audience Prize in the Plowman Chamber Music Competition, the Grand Prize at the Coleman Competition, First Prize at Chamber Music Yellow Springs, and the Silver Medal at the 2008 and 2009 Fischoff Chamber Music Competitions. The Quartet was the 2010-12 Ensemble-in-Residence at Oberlin Conservatory and, in conjunction with Astral Artists, was awarded a 2012 Chamber Music America grant through its Residency Partnership Program for work in Philadelphia schools. The Jasper Quartet has performed hundreds of outreach programs in schools and enjoys educational work of all types. In 2018, the Quartet received their second Picasso Project Grant from Public Citizens for Children and Youth. This grant supports the Quartet's work with a South Philadelphia Public Elementary throughout the spring, culminating in a performance together.